The facilities of Highland Lakes Country Club and Community Association are available for rent for “Family Events” by members in good standing as defined by the Club’s By-Laws. Rentals for Family Events are available, subject to Clubhouse activity and meeting scheduling, from the first weekend after Labor Day to the following June. No rental may take place after June 22. Family Events are those family parties and celebrations which you generally host and invite other family members to, along with family friends and guests, as well as those other parties and celebrations which you, as a family member, are generally invited to. Family Events include but are not limited to: Weddings, Bar/Bas Mitzvahs, Christenings, birthdays, and anniversary parties. To rent any of the Club’s facilities, you are required to read and sign the Club’s terms and conditions (the rental agreement form is available in the Club office), as well as provide a security deposit, rental fees, and the Certificate of Insurance meeting the Club’s specific requirements (which are detailed in the form). Any breach of the terms and conditions of the Club’s rental agreement (formally available in the Club office and are referenced below for information only)—will result in the loss of the security deposit and/or the forfeiture of future rental privileges for a period of 5 years. Can I rent the Clubhouse facilities on behalf of friends and/or family? Can I rent the Clubhouse facilities for anyone else? Are the Club facilities accessible to the disabled? What rooms are available for childrens’ parties? What is the seating capacity for the club’s rental facilities? What do I need to submit a rental request? What times are available for rental, and how long can my event be held? Under what circumstances can the Club cancel my Family Event? What are the rules of conduct for my event? What is the role of the hostess/host, and what hours are they available? Can I use the kitchen for my event? What are the insurance requirements for my event? Who is responsible for personal property at my event? Can I bring displays and decorations to my event? What are the rules about using Club property during my event? What are the rules and policies for family event set-ups/take-downs and decorating? What is the policy for holding outdoor ceremonies at the Clubhouse? Are any devices and/or equipment prohibited? Are licensing, inspections and insurance required for food service? 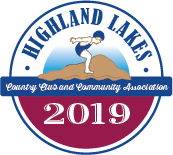 Members in good standing may also rent the Clubhouse for friends in Highland Lakes provided they are members in good standing of Highland Lakes Country Club and Community Association. However, a Member may not rent the Club’s facilities for any purpose other than a Family Event (as defined above). In addition, a member may not rent the Clubhouse for a member of Highland Lakes, or any member of that member’s household, who is not in good standing, and/or persons who are not property owners in Highland Lakes and who are not family members. Can I rent the Clubhouse facilities on behalf of anyone else? 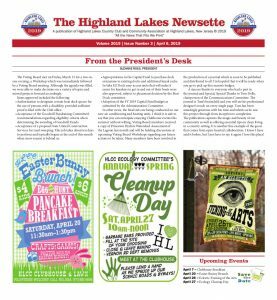 A member may not rent the Clubhouse for a member of Highland Lakes, or any member of that member’s household, not in good standing, and/or persons who are not property owners in Highland Lakes and who are not family members. A rental fee of $25 and a security deposit of $25 are charged for a two-hour party, which includes one hour (before and after) for set-up and clean up. Parties for children ranging in ages from 3-12 are restricted to a maximum of 25 children. Parties must be held during Club office hours or when a host/hostess is available. Following below are the rental fees associated with each of the rooms and areas available in the Clubhouse. All checks are to be made payable to: Highland Lakes Country Club and Community Association. In order to hold the room(s) for a specific date, you will need to sign the Club’s formal rental agreement, and submit a security deposit, rental fees, and a Certificate of Insurance that meets the Clubs requirements set forth on page 5, paragraph 11 of the Club’s rental agreement. Failure to meet these requirements by the submittal date will result in the cancellation of your reservation. Member shall pay, by check or money order, the applicable rental fees (contained in Paragraph 3 of the Club’s rental agreement). A Certificate of Insurance (see Paragraph 11 – Insurance Requirements) must be returned when you submit the signed Agreement. Upon review and approval of the Agreement and Certificate of Insurance, a signed copy of the Agreement will be returned to the Member signifying the Club’s acceptance of the Family Event. The Member shall pay the Security Deposit of $250.00 at the time the Signed Agreement, Rental Fees and Certificate of Insurance are submitted to the Club Office. The Security Deposit must be in the form of a check or money order payable to the Club, and may be included in the check or money order or paid by check or money order separately. What dates and times are available for rental, and how long can my event be held? Due to Club activities, the latest a rental may be booked is Sunday, June 22. No rentals take place after that date. The rental period is defined as 9 AM to 11:59 PM on the day of the Family Event. The duration of the Family Event is limited to a five-hour maximum period and a maximum of three hours for set-up and clean-up. The Family Event shall commence no earlier than 10 AM. The Member renting the Club’s facilities must be present at all times during the Family Event. The Member agrees to conduct the Family Event in an orderly manner, in full compliance with applicable laws, regulations, the Club’s rules and this Agreement. The Member assumes full responsibility for the conduct of all persons in attendance and for any damages done to any part of the Club’s premises during all times such premises are under the control of the Member, or the Member’s agents, invitees, employees, or independent contractors employed by the Member. The Member hereby indemnifies and holds harmless Highland Lakes Country Club and Community Association against any and all claims, liabilities or costs (including reasonable attorney’s fees and whether by reason of personal injury or death or property damage or otherwise) arising out of or connected with the Family Event or this Agreement, caused or contributed to by the negligence of the Member, or any guest, invitee or agent of the Member or independent contractor hired by the Member. Ride-on toys are not permitted anywhere in the Clubhouse and on the deck. Appropriate attire is required at all times. Bathing suits and bare feet are prohibited. All tables other than the patio tables must be covered at all times. At the conclusion of the party, all garbage must be taken out to the dumpster located on the far side of the Maintenance Building. The Member is responsible for notifying the Hostess/Host of any spills or breakage that occurs during the Family Event. 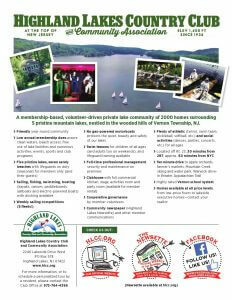 The Club employs a Hostess/Host to assist you in planning and conducting your Family Event. May I use the kitchen for my event? Activities permitted: The kitchen may be used to prepare foods, beverages and desserts. The kitchen is equipped with a freezer and refrigerator, hand sink, food preparation sink, prep tables, ten-rack convection oven, and also has a supply of pots, pans, utensils, etc. While potatoes may be baked, pasta cooked, and salads prepared, the Member and/or the Member’s agents, contractors or employees may not engage in any food preparation activity that generates grease-producing vapors. Cleanliness: The cleanliness of the kitchen and appliances must be left in the same or better condition as found prior to the commencement of the Family Event. ONLY cleaning products and supplies furnished by the Club under this Agreement may be used. All items used must be returned to their original location. No food, refreshments, garbage, etc. may be left behind in the kitchen. All displays and/or decorations proposed by the Member shall be subject to the prior written approval of the Club in each instance. In the Lake Room, nothing is to be placed on the walls, ceilings, doors, and windows. In the Seckler and Craft Rooms, scotch tape may be used to affix decorations to the walls only; tacks or staples are prohibited. Removed from any wall or ceiling. However, the Member may remove only the small, square patio tables from the Lake Room, together with the matching chairs, for use on the deck only. The Member is responsible for placing these items back into the Lake Room at the conclusion of the Family Event. This rental agreement does not provide for the use of the Club’s sound and/or video electronic equipment. The Member may use the screen found in the Seckler Room. Any film or movie shown during the Family Event must be rated G, PG, or PG-13 by the Motion Picture Association of America. The Member is permitted to bring sound equipment (amplifiers, speakers, etc.) for the use of a DJ or band. The Clubhouse has three wire Sterno racks, which you are welcome to use, however, you will be responsible for supplying the Sternos. All dinnerware, tablecloths, cups, ice, etc. shall be provided by the member renting. The room arrangement (which is shown in the Set-Up Sheet) is due fourteen (14) days before your scheduled Family Event. If you are using tables and chairs supplied by the Club, our staff will set-up and take-down the tables and chairs as specified on your Set-Up Sheet. Under no circumstances will the Club’s staff set-up, transport and/or dismantle any equipment, items, chairs, tables, etc. which are not owned by the Club. Set-up and decorating is permitted only on the day of the Family Event. You are welcome to conduct your ceremony on the lawn at the Clubhouse. However, this Rental Agreement does not provide for the conduct of your Family Event on the lawn. Tents, canopies, and amplified sound or music are not permitted under any circumstances. If you are planning to have a lawn ceremony, please be aware that we are visited quite routinely by Canada geese, who have an affinity for the lawn’s grass and who leave their droppings behind. Your planning should, therefore, provide ample time to rake the lawn area you plan to use. Should a lawn ceremony be specified on your Set-Up Sheet, 30 chairs will be set aside in the Clubhouse for you. However, you are responsible for set-up and making sure that they get brought back into the Clubhouse at the conclusion of the ceremony. Due to the sensitivity of the smoke alarm systems, smoke and fog machines are prohibited. Propane devices are prohibited within all buildings. Due to the potential for damage to flooring and rugs, “chocolate-type” fountains are also prohibited. All electrical, cooking, and other devices to be transported to the Clubhouse for use in the Family Event must be identified on the Set-Up Sheet. the caterer’s food handler’s license. the current license for the kitchen facility in which the food is being prepared. The kitchen facility’s most recent inspection report issued by a local health authority. a certificate of insurance from the caterer.